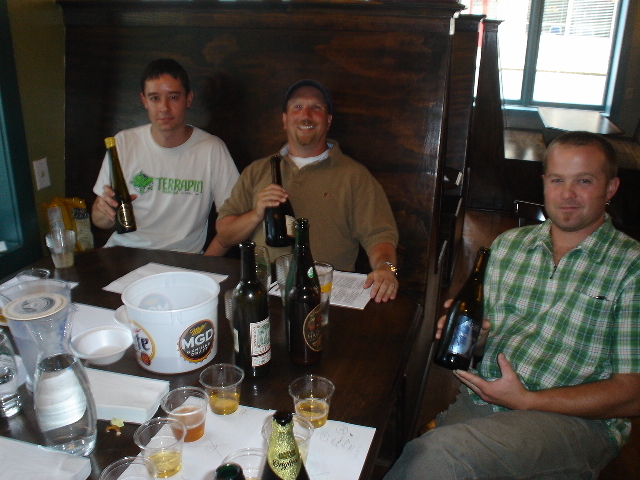 Brewtopia Events Blind Tasting / Evaluation - Hard Ciders from around the world. 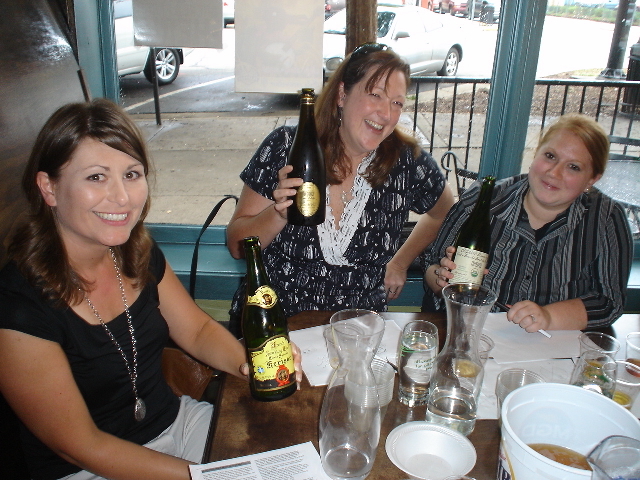 L-R: Amy Shane, Kerri Allen and Jessica Allen - cider lovers to the core. Eric Johnson (Eric is co-owner of Trappeze Pub in Athens, GA). Owen Ogletree (director of Brewtopia Events LLC) departed from the usual beer theme and gathered together fellow cider lovers on July 9, 2008 at Trappeze Pub in Athens, GA to sample and comment on several mixed styles of apple and pear ciders from commercial and craft producers from around the world. This sampling was done as a "best of show" blind tasting where no one was aware of the brands that were being served. Products were informally commented upon and ranked according to Beer Judge Certification Program (BJCP) style guidelines for cider. First, second, third places, and honorable mention were awarded to the products we felt represented their individual styles in extraordinary fashion. Many thanks go to Sachin and the fine guys at Five Points Bottle Shop in Athens, GA for providing delicious ciders. Drop Owen an email to share your comments and opinions. Aroma: Mulling spices; rich cooked apples; apple pie; syrup; sorghum; brown sugar. Appearance: Hazy; dark orange; sedimented; light red color; no carbon dioxide. 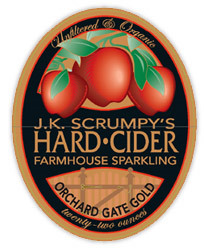 Flavor: Honey; peaches; biscuits; caramel; toffee; very sweet; syrupy, but not unpleasantly so; full mouthfeel and body; thick; great dessert cider; maple notes. Aroma: Earthy; hay; dried leaves; pungent; acid notes. Appearance: Slight haze; medium white foam; very light golden color. Flavor: Tart; lactic notes; grapey; viscous; farmhouse character; green fruit; complex; winey; acidic complexity; muscat grape hints; very pleasant. Aroma: Honey; pears; apples; honeydew melon. Appearance: Clear; effervescent; white foam; yellow in color. Flavor: Spicy; honey; musk; pinot grigio notes; medium body; effervescent; good tartness and acidity; pleasant; moderately fruity; ripe apple and pear complexity. Aroma: Honey; apple tannins; vanilla; vinegar hint; diacetyl notes. Appearance: Light honey color; clear; very light carbonation. Flavor: Medium body; very sweet; apple character is nice; minor apple vinegar hints; residual sugars are pleasant; refreshing and complex. Aroma: Apples; apple juice; yeasty; dough; paint hints; all aromas are very mild. Appearance: Light gold in color; clear; almost no fizz; peach color hints. Flavor: Big honey notes; mild pungent fruit hints; rich apple and honey flavors; mild tartness; earthy and moderately rich in flavor. Aroma: Sweet; mild apple; crisp apple notes; light nose. Appearance: Very pale straw yellow; low carbonation; very clear and filtered. Flavor: Apple sauce; slightly tart; soda pop notes; candy hints; light bodied; medium dry finish; thin. Aroma: Faint aromas of green apple; hint of spices; alcohol notes. Appearance: Very clear; light gold; big bubbles; champagne like. Flavor: Champagne like mouthfeel and carbonic bite; foamy; dry; tart; mild/moderate apple notes; oaky tannins. Aroma: Camphor; band-aid; strong phenols; smoke; electrical fire; rubber; leather notes. Appearance: Hazy; lots of sediment; light orange in color. Flavor: Apple notes are hidden behind phenols and off flavors; lemon; citrus notes; lingering phenol finish on tongue. Aroma: Light phenols with apple notes; mild aromas; clove; vanilla. Appearance: Clear; hay; deep straw color; almost no carbonation. Flavor: Mild; dry; smoky note; lactic notes; lingering mild phenols; soapy, thin mouthfeel for alcohol content; dry; mild flavors; light CO2 tingle in mouthfeel. Aroma: Sweet; sugar; spices; melon; very mild aromas; acidic, slightly vinous notes. Appearance: Peach color; clear, light carbonation; very bright. Flavor: Sugary sweetness; bland; not much complexity; very little apple character; like a wine cooler; very two dimensional. Aroma: Phenols; apple; wet wool; musty; earthy; mild aromas. Appearance: Clear, apricot color; deep yellow; moderate carbon dioxide. Flavor: Smoky; earthy; rustic; bright CO2 bite; dry; woody tannins; matches; sulfur hints; effervescent; pleasant and complex. Aroma: Sweaty; musty; citrus zest; salty; mineraly. Appearance: Clear; extremely pale yellow; color of lemon/lime soda. Flavor: White wine spritzer; very dry; very effervescent; mild white wine and club soda tones; tonic water; very mineral like on the tongue.